In September, the U.S. economy added just 142,000 jobs, falling short of Wall Street’s expectation of a 200,000 increase. 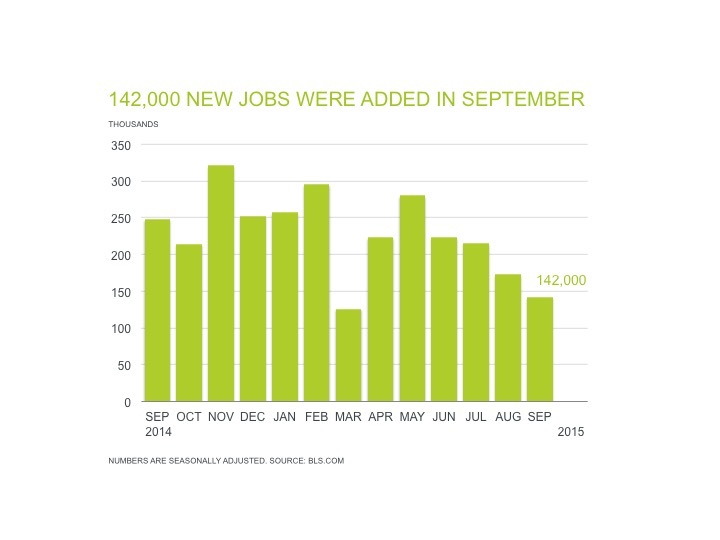 BLS’s October 2 report also reduced August’s employment gains from 173,000 to 136,000. For that month, most economists projected an increase of 220,000. The national unemployment rate remains unchanged at 5.1 percent, but the labor participation rate dipped lower to 62.4 (from 62.6 percent), a 38-year low. Friday’s jobs report makes it unlikely that the Federal Reserve will raise interest rates later this year for the first time in nearly a decade. Administrative and support services added 8,800 jobs nationwide between August and September 2015, while employment services (HR) gained 5,300 jobs. Healthcare saw an increase of 34,400 jobs over the same period–reflecting this sector’s strong growth throughout the year. Healthcare added 34,000 jobs in September. The health industry has created an average increase of 38,000 jobs per month over the prior 12 months. Hospitals accounted for 16,000 of the jobs gained in September. Employment in information increased by 12,000 in September, and has increased by 44,000 over the year. Professional and business services added 31,000 jobs in September. Job gains has averaged 45,000 per month thus far in 2015 compared with an average monthly gain of 59,000 in 2014. Retail trade employment increased by 24,000 jobs in September, with an average monthly gain of 27,000 over the prior 12 months. Employment in construction, manufacturing,wholesale trade, transportation and warehousing, financial activities, and government, showed little or no change for the month of September. While BLS’s most recent employment summary shows a fragile economic recovery, job seekers in healthcare, business services (such as HR) and office administration tend to have more career opportunities compared to certain industries—such as manufacturing and mining. For example, employment in health services management is expected to grow 23 percent from 2012 to 2022, according to BLS’s Occupational Handbook—while the average growth rate for all occupations is 11 percent. Companies continue to seek top talent in healthcare, business services and administration. Most of the job gains for 2015 are taking place in healthcare, as well as, professional and business services. For example, the health industry has created an average increase of 38,000 jobs per month over the prior 12 months, while professional and business services has averaged 45,000 per month so far in 2015. These industries are somewhat insulated from the risks of automation and outsourcing. Automation cannot take the place of office managers and nurses, and higher-end professional services (like consulting and design services) have thus far held their own against the trend of outsourcing. As the corporate world continues to embrace innovation, as well as, disruptive, new business models, employers need to stock up on agile, skilled candidates who have the ability to drive optimization campaigns within their organization. 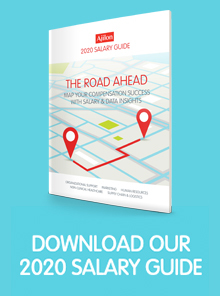 Download our free 2016 Salary Guide so you can make competitive offers to top talent.